Casey Neistat showed us a brilliant way to turn your cheapo Apple Watch into a luxurious gold Edition, but if you’d like to make your fake Edition look just like the real thing, you can now get it gold plated for a fraction of the cost of Katy Perry’s. Apple is pushing into new territory with the Apple Watch, by making it the first device to come from Cupertino that uses an OLED display. One of the reasons Apple’s never brought OLED displays to the iPhone is they’re more challenging to engineer than long-established LCDs. Apple hasn’t given us too many details about the Apple Watch’s display yet, other than telling us it’s a ‘Flexible Retina Display’ but the team over at DisplayMate have put the new display to the test, and came away with a shocking discovery: Apple Watch Sport has a better display than the Apple Watch Edition. Renowned fashion designer Karl Lagerfeld showed off his Apple Watch Edition with the first band we’ve seen that isn’t available in stores. And the cost of the custom gold band has to be jaw-dropping. 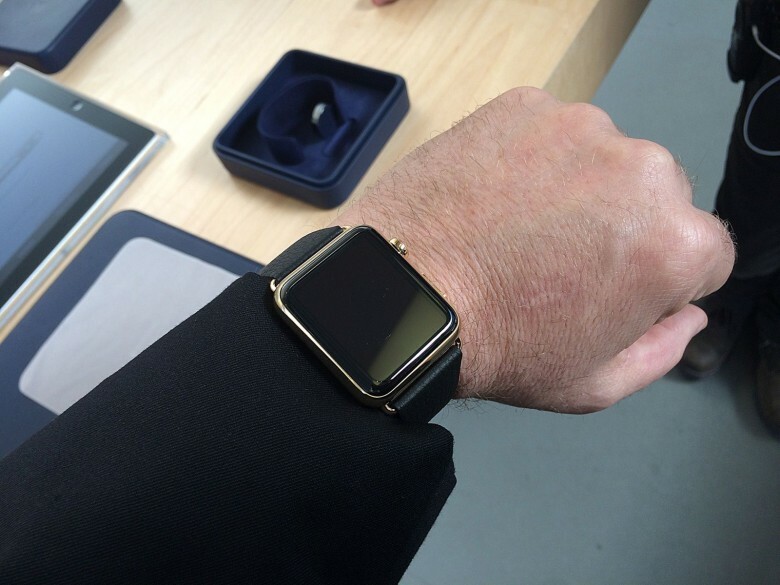 Gold Apple Watch looks great on my wrist. If only I could turn it on. CHICAGO — I grabbed the black suit jacket I was married in because I wasn’t sure how to dress for a private appointment to try on a $10,000 gold watch. My look is challenging to class up. The clean-shaven head, long goatee and ample belly blend in better at a biker bar. 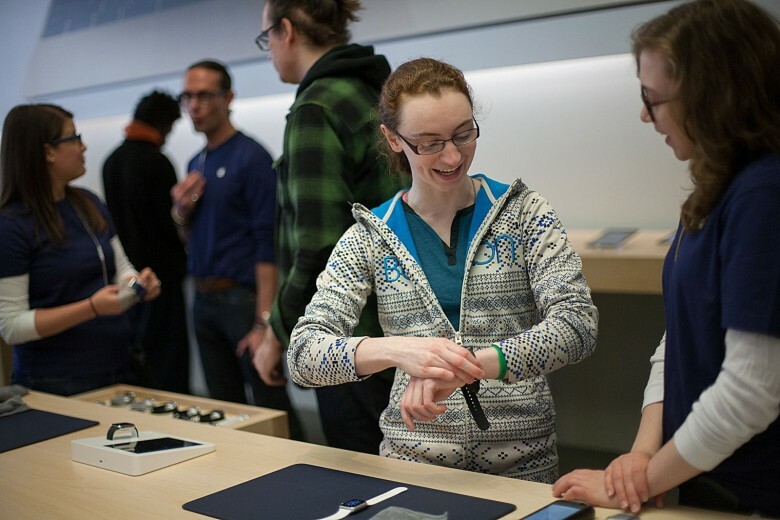 But I felt halfway respectable-looking when I walked into the Apple Store in Chicago’s upscale Lincoln Park neighborhood for a Saturday morning hands-on showing of the Apple Watch Edition. Not many Apple Stores are scheduling appointments for the 18-karat gold Edition, but the ones that do provide extra-special attention. I had a friendly guide, two floor supervisors who came by to shake my hand and thank me for my patience, and a couple of hawk-eyed security guards. 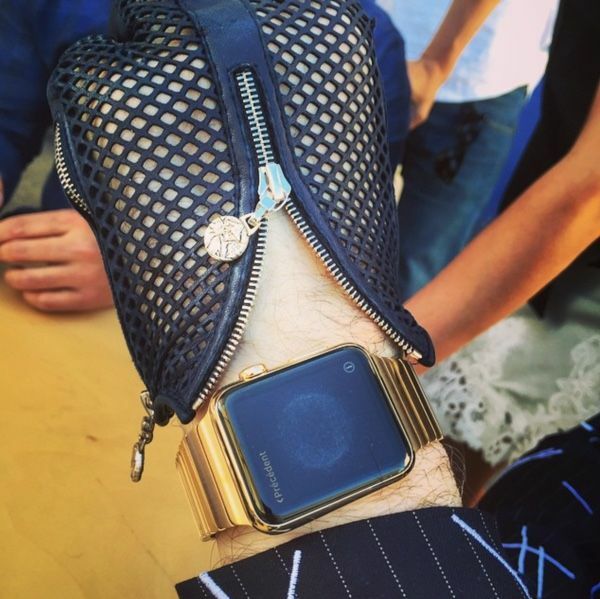 Want to try on the super-fancy $10,000 Apple Watch Edition? You might have to do a bit of driving, because in a whopping 75 percent of the United States, it’s totally impossible to demo the solid gold Apple smartwatch. Only 12 states (and the District of Columbia) have Apple Stores taking appointments to check out the Apple Watch Edition. That leaves 38 states that are apparently not fancy or fashionable enough to offer demos of the schmanciest Apple Watch of all. To see if you live in one of them, check out Cult of Mac’s handy map below, but be prepared to weep. SAN FRANCISCO — Like a lot of people, I took the midnight plunge and bought an Apple Watch before I’d even tried it on. But today, I got to see the device I bought last night. 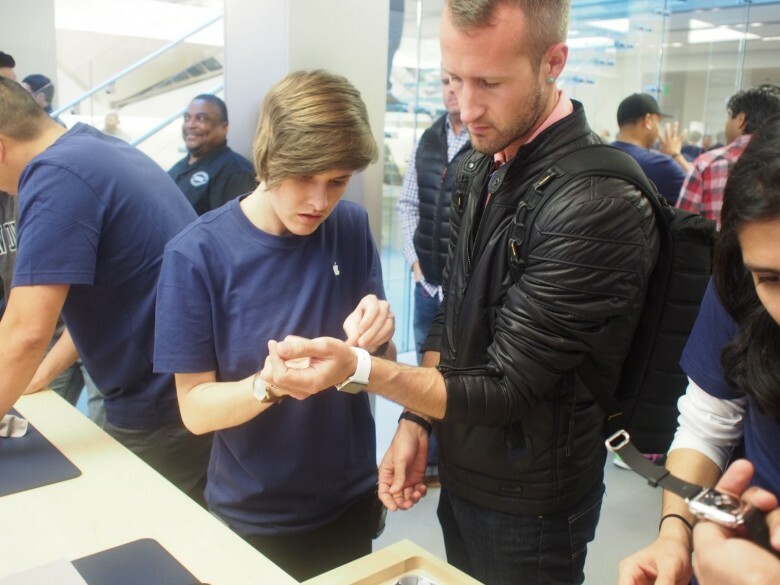 I went down to the flagship Apple Store in San Francisco and tried on a range of watches. I wish I’d done this before, because I might have ordered differently. 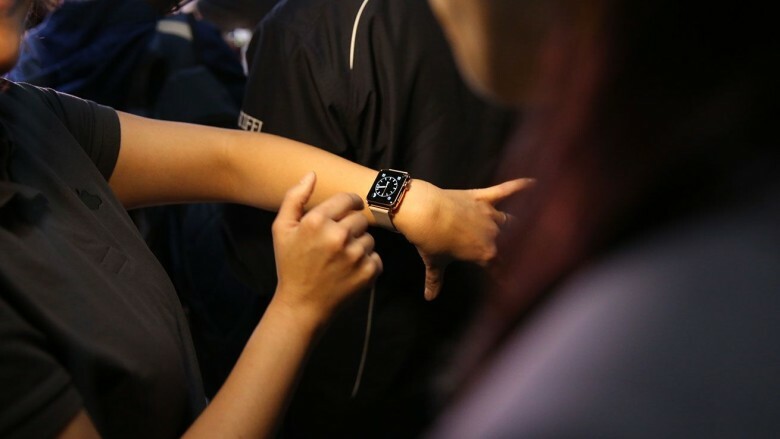 CHICAGO — It didn’t matter that Mel Torgusen had already ordered her Apple Watch at 2 a.m.
She still had to be at the Apple Store on Chicago’s Magnificent Mile at 10 sharp — just to touch one. A steady stream of the curious and devoted filed into the store Friday for the big Apple Watch preview. There were about 20 people who had signed up for the early appointments lined up outside the store when the doors opened. Others who did not schedule appointments for a personal tour went past a showcase of watches, then quickly registered for private showings. 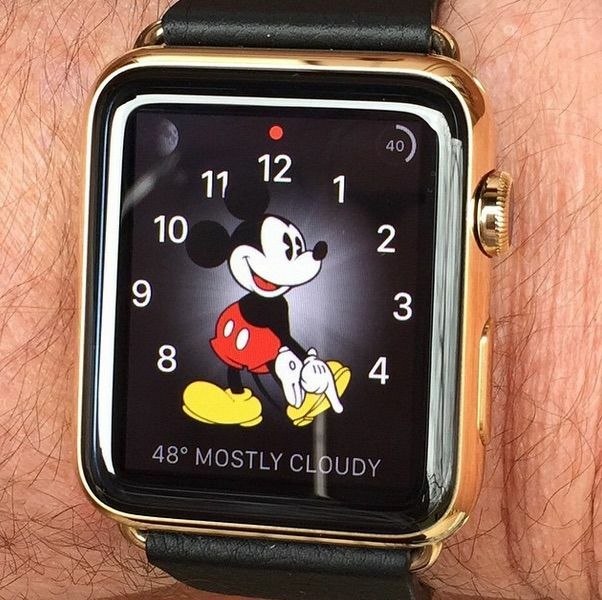 Tim Cook has only said that the Apple Watch Edition will be available in “select stores” later this month. You won’t be able to just walk into any location and try on the ultra-expensive gold model. Now we know exactly which Apple retail stores around the world will sell the Edition when it goes on sale April 24th. 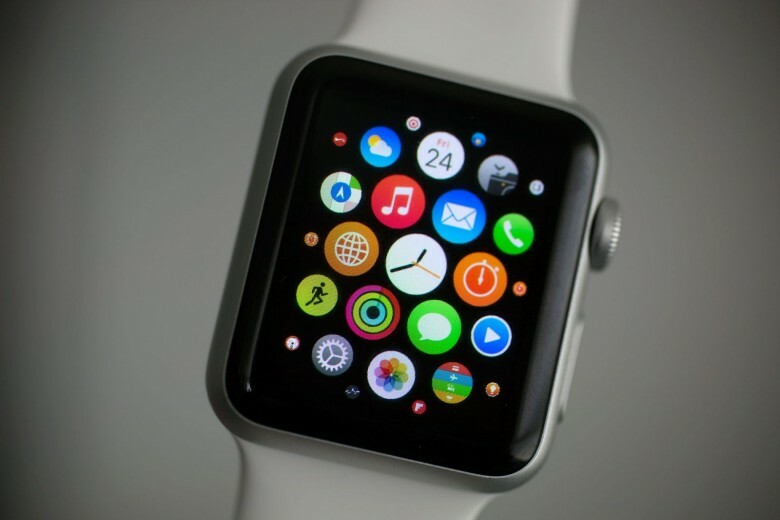 Apple might have just leaked some packaging for the upcoming Apple Watch. The Apple Jobs website received a nice update today — including a new image of what appears to be some of the Apple Watch packaging that will hit Apple Store shelves April 24. The boxes look too thin to hold the Apple Watch and its inductive charger, so they’re more likely just for bands, but we couldn’t help but notice they look just like Swatch’s iconic boxes. 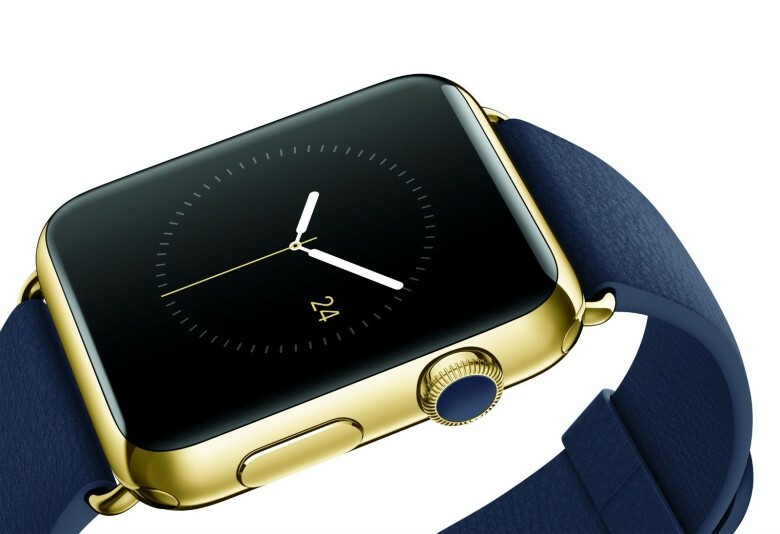 All week, it’s been reported that Apple is using a “new gold” in the gold Apple Watch Edition. According to Bloomberg, Slate, Gizmodo and many others, Apple has patented a new process to create a “metal matrix composite” by mixing gold with ceramic particles. The composite supposedly allows Apple to save on the amount of gold it uses, while making the substance super-hard and adding other amazing properties. But according to Atakan Peker, a materials scientist and one of the co-inventors of Liquidmetal, which Apple holds an exclusive license on, it’s extremely unlikely Apple is using any kind of “new gold” for its watches. He knows this because Jony Ive says so.